Late last year, in my "Predictions for 2018," I thought the main theme for the year would be "waiting for GDP." Policy changes in the previous year had set the stage for much stronger growth, higher interest rates, and a stronger dollar, but I thought the market would be skeptical until clear signs of stronger growth emerged. While there is still every reason to believe economic growth is accelerating, the evidence of a new economic boom is still not yet conclusive. The economy is improving on the margin, but budding tariff wars are dampening enthusiasm and keeping risk aversion alive. Interest rates have moved higher over the course of this year: 5-year real yields on TIPS have increased from 0.3% to 0.7%, and 10-year Treasury yields have risen from 2.3% to almost 2.9%, paced by a 0.5% boost to the Fed's short-term interest rate target. That's small potatoes in the great scheme of things. Both the bond market and the Fed have priced in somewhat stronger growth, but these moves are still modest compared to what one would expect from a solid package of supply-side tax cuts and reduced regulatory burdens such as we saw enacted last year. These things take time, to be sure, and we're still in the early innings. Meanwhile, the risk of tariff wars is driving demand for hedges, and Treasuries are the market's favorite port when economic storms threaten. Consequently, interest rates arguably are still depressed relative to where they should be in a robust growth environment. Back in December, I cautioned that higher interest rates would not be well-received, and a month later, the equity market shed over 10% of its value in a few days. More recently, nerves have been tested as US-China trade relations deteriorate and reciprocal tariff hikes are announced. In December, I thought that further gains in equity prices would not come from higher earnings multiples but rather from rising earnings; so far, the P/E ratio of the S&P 500 has fallen from 21.7 to 21.3, and earnings per share (based on trailing 12-month reported earnings) have increased only modestly, from 123.2 to 132.1. Earnings are going to have to continue improving if equities are to march still higher, and that is all part and parcel of a ratcheting up of economic growth that is likely underway but still not yet obvious. In the meantime, as we await news of unusually strong economic activity, a stronger dollar has accompanied weaker commodity and gold prices, and all have conspired to squeeze emerging market economies, much as I feared. But the dollar is only moderately strong, commodity prices are still quite strong, and the Fed has yet to tighten monetary policy, so the pressure on emerging market economies is nowhere near what it was in the late 1990s and early 2000s. I think we'll see emerging markets begin to recover, especially as - and if - evidence of a stronger US economy emerges. The point of Chart #1 is to demonstrate that real yields tend to track the real growth rate of the economy. 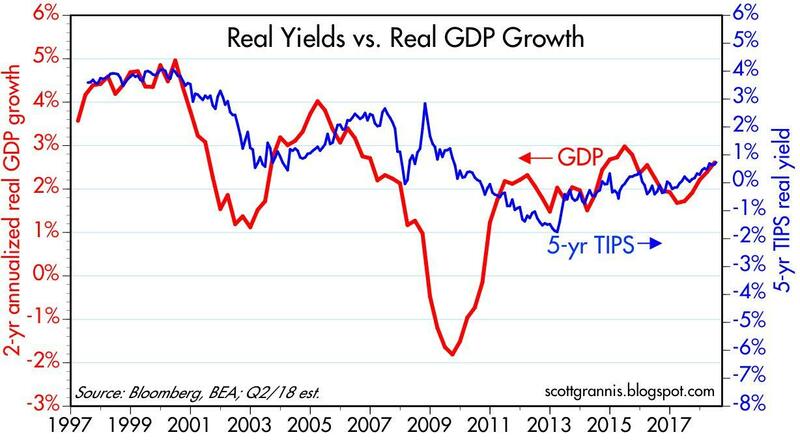 Currently, real yields on 5-year TIPS (the best market-based proxy for short-term real yields I know of) are consistent with economic growth of about 2.5% per year. 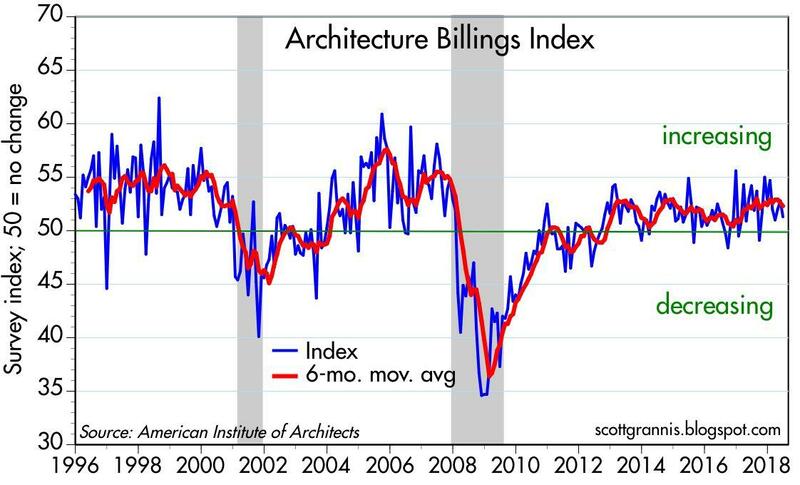 This happens to be only slightly higher than the 2.2% annualized growth the economy has registered since mid-2009, when the current business cycle expansion began. If the market (and the Fed) were convinced that real growth would be 4% or better, we would very likely see real yields on TIPS trading in the range of 3% or so. Chart #2 demonstrates the link between market-based real yields on 5-year TIPS and the ex-post real yield on the Fed's target funds rate. 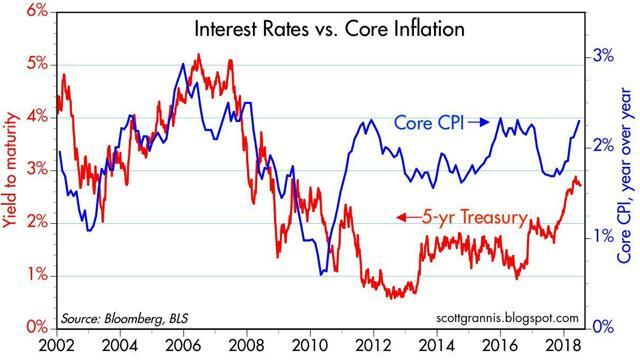 The real funds rate is the Fed's true target, since that is the best measure of borrowing costs. Note that the real funds rate has been zero or less for the past decade, and it hasn't increased much, if any, for almost a year. The red line, the real yield on 5-year TIPS, is essentially the market's expectation for what the blue line will average over the next 5 years. The market is not expecting the Fed to do much in the way of tightening, but it is definitely pricing in somewhat tighter policy for the foreseeable future. 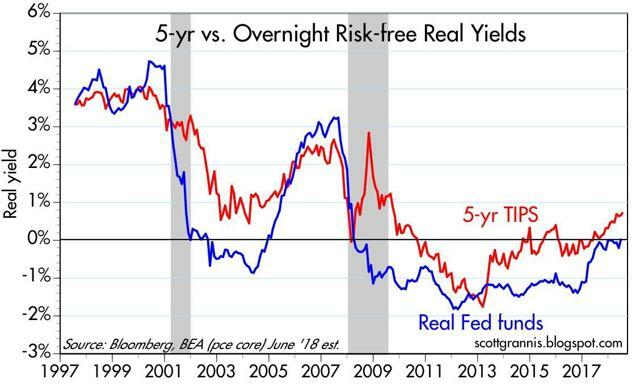 Chart #2 is also a good way to look at the shape of the real yield curve, which is arguably more important than the shape of the nominal curve, which has been flattening for the past several years (the 2-10 spread is now down to about 25 bps). What we see in Chart #2 is that the real yield curve has been steepening over the past year - expectations of future real rates have risen relative to current real rates. Taken together, the shape of the real and nominal yield curves tells us not that the economy is being squeezed, but rather that neither the market nor the Fed are very enthusiastic about the idea of a stronger economy. Chart #3 shows that nominal Treasury yields have been unusually low relative to the prevailing rate of inflation for the past seven years. Only in the past year have nominal yields begun to catch back up to inflation - and they're still relatively low. The fact that the bond market has been willing to accept only paltry real yields for so long is a function, I believe, of a relatively strong degree of risk aversion and a lack of enthusiasm for real growth prospects. Markets have been willing to accept minimal returns in exchange for the safety of Treasuries. In a stronger growth environment, this would not be the case. If inflation holds around 2% and the economy picks up convincingly, I would expect 5-year Treasury yields to rise to 4% or more. 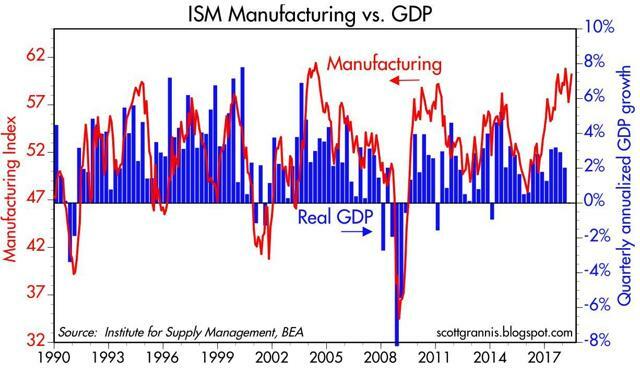 Chart #4 compares the ISM manufacturing survey to quarterly real GDP growth. If there is any one chart that makes the case for a significant pickup in growth, this is it. Based on past experience, the current ISM reading suggests second-quarter growth could be well in excess of the 4% that is currently expected. But that tells us nothing about the long-term outlook for growth. The second-quarter GDP release is almost certain to be strong, but doubts still linger about later quarters. Chart #5 shows the growth rate of private sector jobs. Much has been made of recent "strong" jobs reports, but the truth is that the growth of jobs remains rather mild compared to recent years. 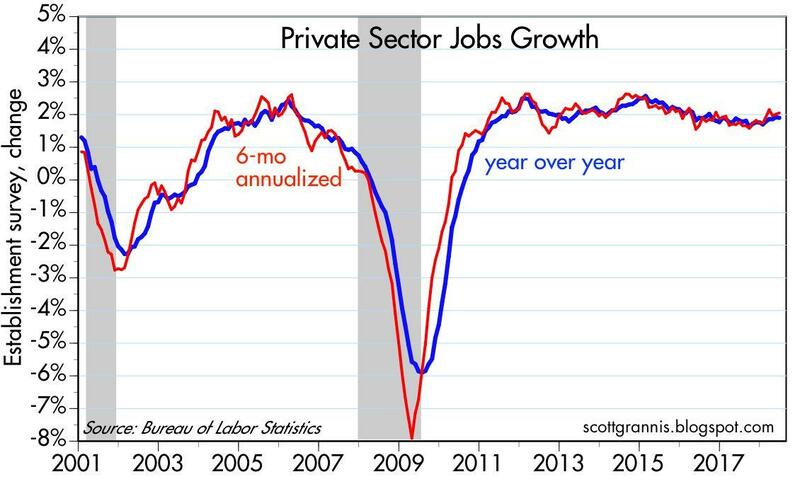 The best that can be said is that the growth of jobs over the past 6-12 months has increased from 1.6% several months ago to now about 2%. 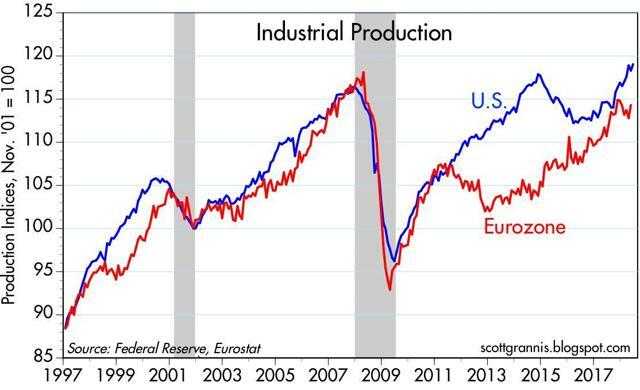 With these kinds of numbers, strong-growth skepticism is warranted. In order to get 4% or better GDP growth, we're going to need a big increase in productivity, and that, in turn, is going to require lots of new investment. I think we'll see it, but we can't find the evidence yet. 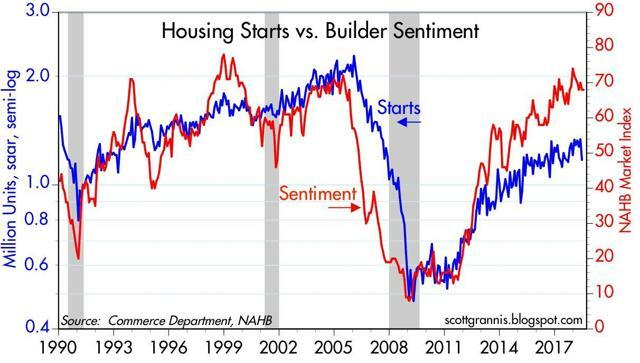 Today's release of June housing starts was disappointing (+1273K vs +1320K), but as Chart #6 shows, starts can be very volatile from month to month. Strong sentiment readings from builders suggest we haven't yet seen the peak in housing construction, but for the time being, housing is not going gangbusters. 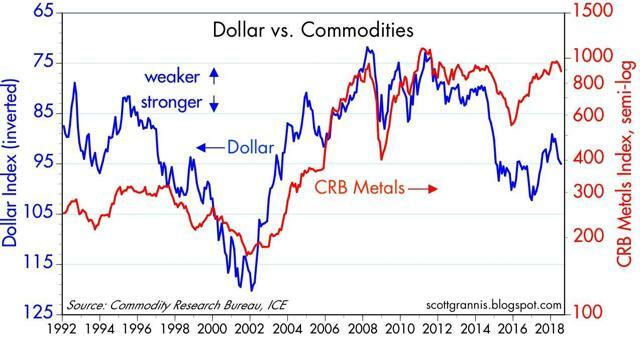 In past cycles, a strong dollar has tended to correspond to weak commodity prices (note that the dollar is plotted on an inverted scale in Chart #10) and vice versa. But although the dollar today is a lot stronger than it was 5 years ago, commodity prices are roughly unchanged compared to 2013. That's good news for emerging market economies, since they are particularly sensitive to commodity prices. They are also sensitive to competing returns in the U.S. and other developed economies. 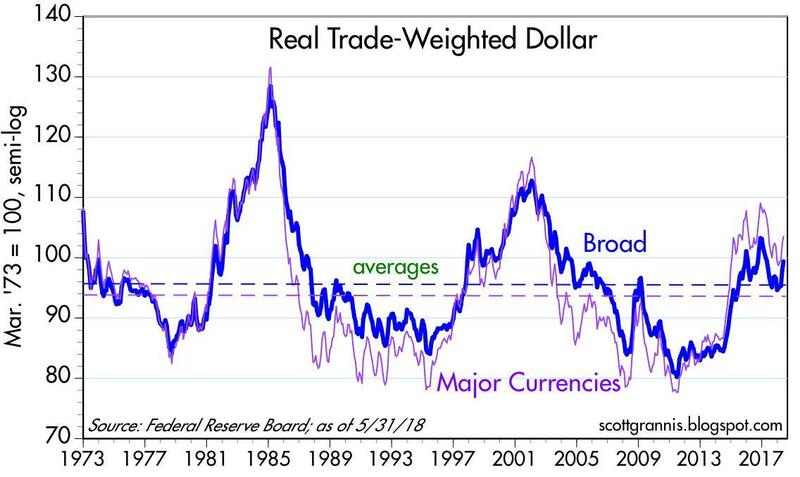 Despite the relative strong dollar, it remains the case that real returns in developed economies are still unusually low and commodity prices are still historically high. So, recent concerns about emerging market economies are likely overblown. Look for some recovery from recently depressed levels. In the final analysis, the biggest concern these days is the potential fallout from escalating tariff wars. To give Trump the benefit of the doubt - which not many are willing to do these days - his ultimate objective is to lower all tariff and non-tariff barriers, and he believes this can be accomplished only by a demonstrated willingness to do the opposite: Trump is playing a game of "tariff chicken." Chart #12 shows facts that he arguably believes bolster his strategy. In the past 12 months, the US has imported about $525 billion of Chinese goods, while at the same time exporting to China only $135 billion. 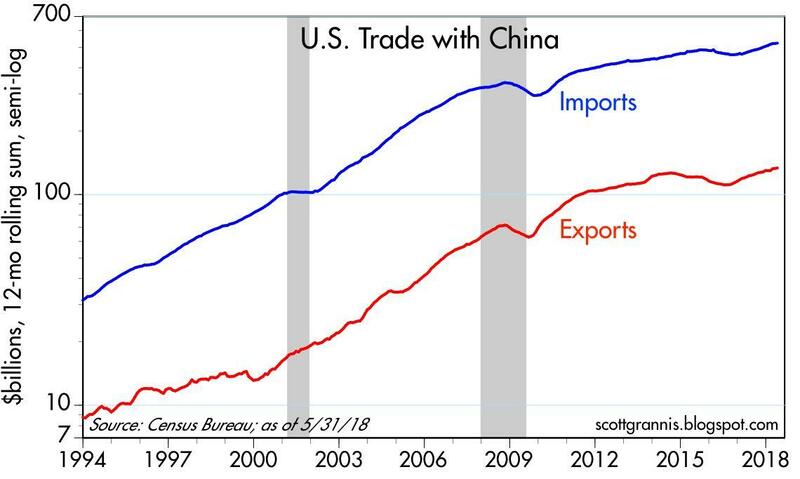 China is selling almost four times more "stuff" to us than we are selling to them. 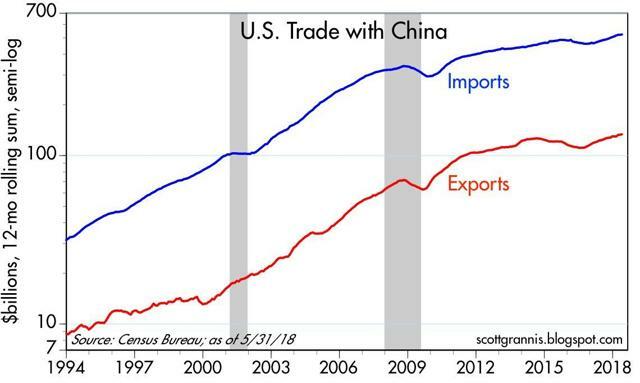 So, the thinking goes, if both countries jack up tariff rates to prohibitive levels, the Chinese have much more to lose than we do, particularly since our economy is still half again as big as China's. At some point, the Chinese will wave the white flag, we'll all agree to reduce or eliminate tariffs and intellectual property right theft, and sweetness and light will return to international trade relations. We can't rule out a successful end to today's tariff wars, but neither can we be confident that they will inexorably lead to a repeat of the Smoot-Hawley tariff wars, which in turn led to the Great Recession. I continue to believe that tariffs are so universally understood to be bad, and even stupid, that eventually our leaders will do the right thing and make trade freer and fairer. Why bet against what would be a win-win for all parties? (Zero tariffs are an economist's dream, since by facilitating free trade, they would be a boon to all countries.) So I remain optimistic, but there is ample reason for many to remain cautious and concerned.